Its a real pleasure to see the potential in a discarded piece of rubbish, then bring it back to life and showcase its character in a humble possession. We take the time to forage for lumber from various avenues like; old fence/farm posts, dilapidated bridges/jetty's & derelict buildings. Some of these chunks of lumber have sat around for more than 50 years with no purpose, so this part of the Veiga business is really about developing a catalogue of salvaged gold that we can utilise in the creation of one off eyewear frames. At this point we have the two choices of timber that we personally source, as we progress along this path there will be more on offer. The frames are reinforced with our flax fibre composite technique and finished with a natural sealant to ensure longevity. Below are examples of the two types of arms we are producing in our "Salvaged Collection". Click through to the "You Choose We Create" section and dream up your ideal frame & material combination, then allow us to craft a truly unique possession for you. The Yellow Stringy Bark is a species that occurs on coastal plains and adjacent ranges in Southeastern Australia near Wollongong, New South Wales. When we uncovered the amount of character this timber develops over time in the elements, we knew it had to be the face of our product range. The indigenous name in the Sydney region for Iron Bark is Torrangora, the lumber is known for its rich red colour and dense structure. 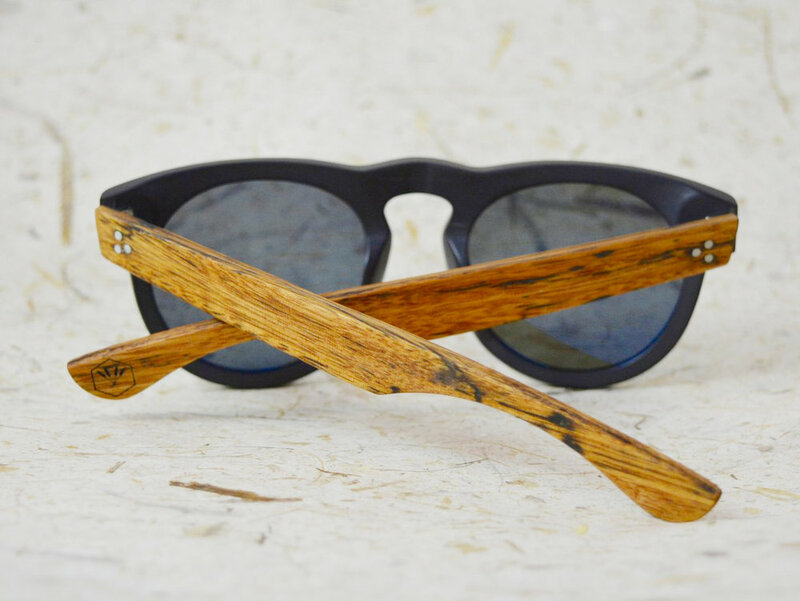 This timber blends perfectly with many acetates and makes for an ideal choice for our product range.